We have been told many times that Breakfast Is The Most Important Meal Of The Day. The danger, it’s regularly claimed, is that skipping breakfast means we’ll get hungry later in the day, eat all the wrong things, and ultimately put on weight. But is it really true? The answer would seem to be yes, if the results of a study published last week are to be believed. Researchers from the German Diabetes Centre in Düsseldorf found that people who skipped breakfast were 33 per cent more likely to have type 2 diabetes – the kind usually associated with being overweight – than those who didn’t. This study adds to lots of others which have compared the health of people who skip breakfast with people who don’t. Almost all of these studies show that breakfast-eaters are slimmer and healthier. But does this prove that eating breakfast makes you healthier? Well, actually it doesn’t. The fact is that people who regularly eat breakfast tend to have healthier habits overall. They smoke less, drink less and are normally more active. To put it another way, it is possible that having a healthier lifestyle is what makes the difference, not the time you choose to start eating. So what is the truth about breakfast? One of the best ways to test a health claim is to carry out a randomised controlled trial. In other words, you take two groups of people and randomly allocate them to two different approaches and see which one is better. A recent study published in the American Journal Of Clinical Nutrition – snappily called The Effectiveness Of Breakfast Recommendations On Weight Loss: A Randomised Controlled Trial – did just that. Researchers got together 300 overweight volunteers, a mixture of ‘breakfast-eaters’ and ‘breakfast-skippers’. They asked the groups to swap habits. The ‘skippers’ were asked to eat breakfast, while the ‘breakfast-eaters’ were asked to become skippers, for 16 weeks. At the end of that period, both groups were weighed. The skippers who had made themselves eat breakfast had lost an average of 1.67 lb. Pretty impressive. However, the ‘eaters’ who had skipped breakfast lost an almost identical amount, an average of 1.56 lb. The researchers concluded that, contrary to what is widely believed, a recommendation to eat breakfast had no discernible effect on weight loss in free-living adults who were attempting to lose weight. Other randomised studies carried out over the years have come to similar conclusions: that simply asking people to change their habits means they lose a bit of weight, regardless of whether or not they eat breakfast. Another widely held belief is that eating breakfast helps to kick-start your metabolism, revving you up for the day ahead. But is this belief based in science? It is certainly true that when you eat, it triggers the digestive process, which in turn means you burn more energy. This is known as diet-induced thermogenesis. So, yes, breakfast does kick-start your metabolism. The trouble is that the effect is pretty small and wears off when the food is digested. From the point of view of your metabolism over the course of the day, it really doesn’t matter whether you first eat at 8am or 1pm. What you eat is more important than when you eat. Eating a high-protein breakfast (such as eggs) requires more energy to digest it than eating cereal. Eating a breakfast that is rich in protein, such as eggs, ham or fish, is also far more satiating and will keep you fuller for longer. Although I don’t think when you have breakfast is that important, there is plenty of evidence about the negative impact of eating a large meal at the end of the day. That’s because eating late at night, when your internal body clock is telling you to wind down, is very disruptive for your metabolism. To demonstrate this, I recently decided to do a little experiment on myself. After an overnight fast (12 hours without anything to eat or drink), I had some bloods taken by a friendly doctor. 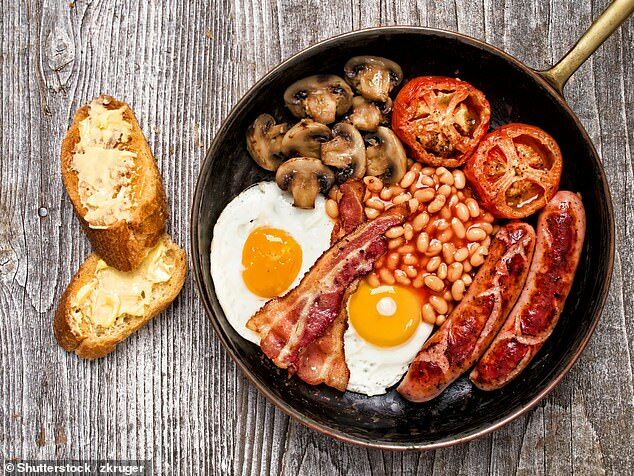 Then, at precisely 10am, I had a classic British fry-up of bacon, eggs and sausage. Straight after the meal I had more bloods taken, and then every half hour for the next few hours. I then had nothing but water until the late evening. Twelve hours after eating breakfast, at 10pm, I had my second meal of the day. It was exactly the same as my breakfast – bacon, eggs and sausage. Again my bloods were taken regularly over the next few hours before I eventually decided that I’d had enough and crawled into bed. When the results of blood tests came back, they were shocking. After eating a full English fry-up in the morning, my blood sugar levels rose quickly, but returned to normal within a couple of hours. The levels of fat in my blood also rose fast, then began to drop after about three hours. What happened in the evening, however, was very different. Despite eating exactly the same meal, my blood sugar levels went up and stayed high for several hours. The fat levels in my blood were even worse, still rising at two in the morning, four hours after I finished eating. I don’t know when they stopped rising because by then I was asleep. What is clear from many studies is that our bodies don’t like having to deal with lots of food late at night – a midnight snack will have a much worse impact on you than the same food eaten earlier in the day. Starting in February, I am doing my first live tour in the UK, talking about intermittent fasting, my career in television and what I’ve learnt about health and weight loss. 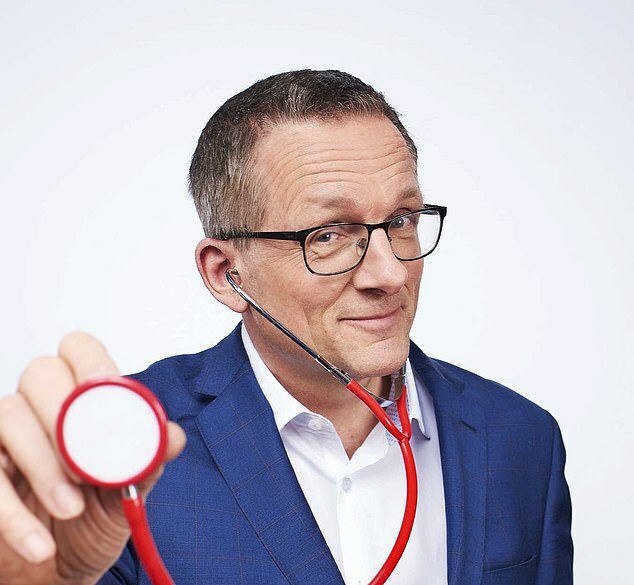 Find out where I will be talking and when at michaelmosley.co.uk.